Corn and butter. Butter and corn. There’s got to be a couple hundred different recipes you can make with those two ingredients when you expand your mind past just frozen corn or corn on the cob and include things like cornmeal or butter flavoring. The possibilities are endless. Which is why I had such a hard time coming up with what to make for this Improv Challenge. Never heard of the Improv Challenge? Blasphemy! To find out more about it, click on Kristen’s blog, Frugal Antics of Harried Homemaker. And then join in on the fun next month when we tomatoes and peppers as our ingredients. Please? No lie, I immediately thought of about 10 different recipes I could make with these two ingredients. I seriously debated on making corn ice cream but my ice cream maker was otherwise engaged so I had to choose something else. Don’t worry though, if you’re interested in corn ice cream I promise I’m going to make it soon! Corn salads are one of my favorite things to make in the summer. They pair so nicely with everything and are usually so quick to whip together that its the perfect warm or cold salad to serve with dinner to bring to a cookout! 1. Slice the kernels off the ears of corn. 2. Melt the butter in a large skillet over medium heat. 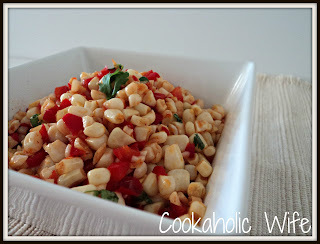 Add the corn and red pepper and cook for 8-10 minutes or until soft. 3. Transfer to a large bowl, squeeze lime juice the corn and peppers. Sprinkle with salt and chipotle chili powder. Add chopped cilantro. Toss to coat. This is one of those side dishes that I wouldn’t need to share with anyone and could just eat up the whole bowl myself. Believe me, I thought about it. The chili powder provides the smoky flavor and pairs really nicely with the natural sweetness or the corn and pepper. I highly recommend you make this right away!